For many years Mark and I did this kind of work to earn money for other people, now it's our turn. Window Genie announces the grand opening of its newest location in Thornton on August 1st. Local friends and business partners Chris Rhodes and Mark Jones are the owners. Window Genie is a national home service franchise specializing in residential window cleaning, window tinting, pressure washing, gutter cleaning and more. 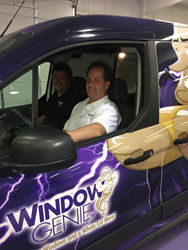 Window Genie of Thornton will serve the northern Denver communities including Brighton, Northglenn, Westminster and Commerce City. Window Genie of Thornton opens for business on August 1st. All field technicians are fully trained, insured, bonded and have passed a background check. Estimates are free on all services. For more information, please contact owners Mark Jones and Chris Rhodes at 720-573-8950 or via email at mjones(at)windowgenie.com and crhodes(at)windowgenie.com.